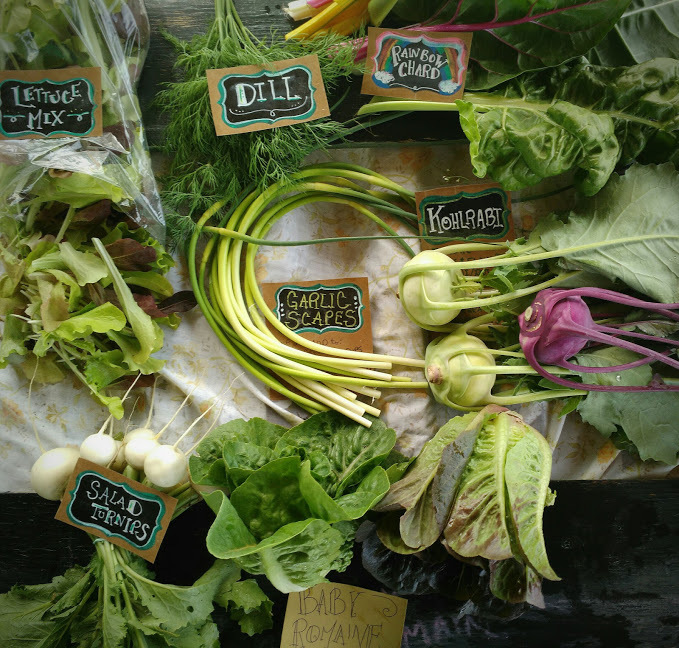 Things are growing slowly and steadily here at the farm. The majority of the squash got in two weeks ago, the corn was planted last week, the potatoes are getting hilled for the first time this week. The first planting of beans got seeded last week and the tomatoes in the high tunnel will be trellised soon. The pea trellises finally went up and our normal weekly salad greens went in the ground. Spring crops are coming out of production and those beds are getting reseeded with summer crops. Hooray! We are having a normal amount of pest pressure and now that a few very abnormal 90°+ days are behind us, it looks like we have some beautiful seasonal June weather in store. For now, the farm is looking good! Jay and I are stepping back everyday and wondering how it is that we aren't feeling totally overwhelmed all the time like we have felt this time of year over the last three years. There are lots of reasons. Most of them have come with a great deal of planning and intention this year. First we decided this year to stay small. When you visit, it might seem like, “wow this is such a big garden!” but really, it's not a garden, it's a vegetable farm. And for a production vegetable farm, we are a Very Small Farm. How can two people raising three kids pull off running a small farm? This is a question we ask ourselves often. We are just beginning to be able to answer that. This year we have been able to hire out some labor for the first time and it has been….just...so...amazing. We have one friend, neighbor, CSA member, and fellow farmer coming helping to transplant and weed a few hours each week, a young nursing student who comes out to help weed and transplant one morning a week, and a very large and capable teenaged young man working for us one morning a week doing heavy work including shoveling, schlepping compost, and weed eating. We also have a wonderful young lady we've hired to be our market assistant this year. Though they don't work many hours, they are hard workers and fun to be around. We are so thankful to each and every one. Simply, the hours they put in are hours Jay and I aren't working. It's a small start, but has made our workload Much More Sustainable. And really, we've been able to take this step because you all have supported us. So thank you!! Garlic Scapes This delicacy is the seed head created by each garlic plant. I harvest scapes just as they start to emerge from the plant, and pull them out oh-so-slowly to get the super long scape. I prefer young scapes like these to the tougher, older ones that have started to curl. 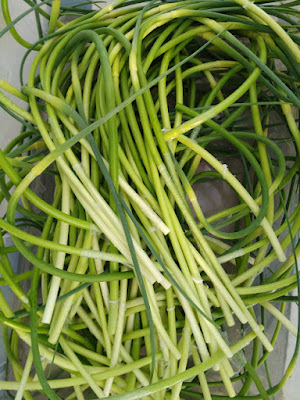 You can use garlic scapes in place of garlic in any recipe. When people ask “what do I do with these?” I answer, “What can you NOT cook with these?” Seriously! Garlic makes everything better; homemade pesto, mayo, or salad dressing….yum! 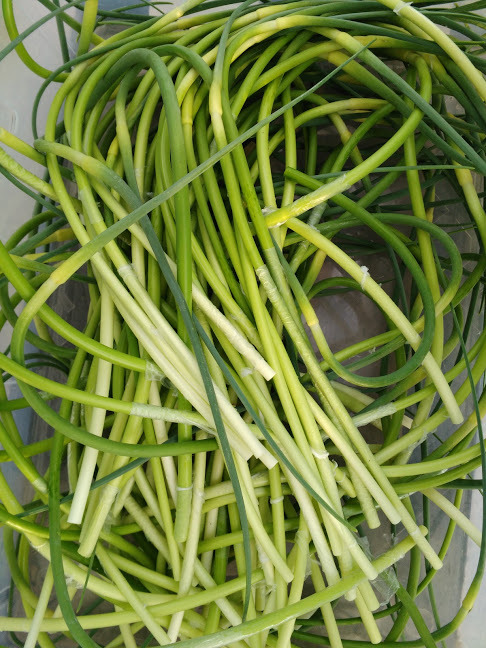 Some of my favorite ways to cook with scapes are to dice and saute with greens, dice and add to stir fry, get out a veggie peeler and make big long peels, coat peels with olive oil, and top a pizza. They are also good grilled in a grill basket. If you want to save some for later you can put them in a blender/food processor with butter or olive oil and freeze for using as a pesto/sauce later. Kohlrabi is a member of the cabbage family and though it may look like a small strange planetoid, I think of it as a 'cabbage turnip.' They're good raw or cooked and we love them with dill. You can slice them very thinly and eat them raw with yogurt and dill and you're going to be like, OHMANTHISISGOOD! Also you can saute some of your garlic scapes in butter for 2-3 minutes, thinly slice the kohlrabi, and saute with the scapes 2-3 minutes. Turn off heat and add chopped dill. Then I suggest you go find a chair because you're going to want to sit down when you taste 'em! (Everyone chant) Grow! Carrots! Grow! Next week we will have more of those pretty purple 'green' onions, lettuce mix, and keep your fingers crossed for either beets or carrots.